I was in the process of making my house a home. The first thing I needed to address had to be the thing that took the longest to mature. That would be the trees. Since I required a yardful of them, I couldn’t afford to purchase mature trees. Fortunately, I could afford something more than mere seedlings. Size wasn’t a problem. Something else was. I knew what I wanted. Rather, I knew where I wanted to end up. I had no idea how to get there. Don’t get me wrong. I knew I wanted a garden, and, thanks to my father and grandfather, I did know how to cultivate one. Growing up, I helped a lot with the garden. I enjoyed it. On the other hand, I also helped a lot with the landscaping and didn’t enjoy it. While my father believed he was teaching me the finer details of landscaping, in truth I never paid attention. I just mindlessly did what he told me. Physically, I nurtured the plants and trees around our yard. Mentally, I was doing my math homework, plotting out sequencing of football plays, or imagining what it would be like to discover a new star. They drew up elaborate plans. Maybe too elaborate for me. Out of respect, I did what they said. Today, my son has taken up the mantle. For me, I only really envisioned one thing – a curtain of evergreens along the far property line of the back yard. That’s where the blue spruce came in. Rather, that’s where the blue spruces came in. I didn’t trust myself, so I brought my father and brother with me to Pittsford Tree and Landscape. I told them of the evergreen curtain I envisioned. They had just enough small blue spruce trees left in their inventory. I bought all thirteen – a baker’s dozen – without hesitation. Arriving home with the new trees, I immediately took them out back. I spaced them out as directed. The backyard dwarfed the little trees. I asked my father for his opinion, suggesting it might be better to buy more and plant them closer together. Dad laughed. He knew how big they’d grow to. He said, as far apart as they seem, they might be too close to each other. He convinced me to leave them be. Within a decade, the branches closed the gaps between the trees. I had my evergreen curtain. The ideal had been achieved. Just like microwave ovens, DVDs, and VCRs, my kids never knew what life was like before this evergreen curtain. The trees acted as a faithful backdrop in every family event. We took them for granted. Then, several weeks ago, the inevitable winds of change swept across the land. 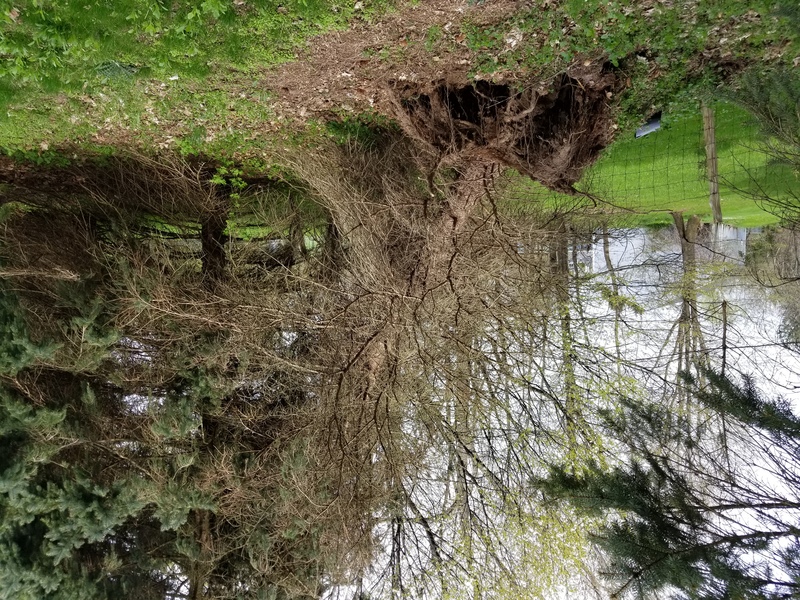 At first, the winds didn’t appear any different than past windstorms. And the only change that we saw that week was the end of the more than 100-year tradition of the “Boy Scouts of America” name (it’s now called “Scouts BSA,” among other differences). In fact, I originally wanted to write an ode to the passing of the Boy Scouts, but an errant discovery just before twilight tugged my heart a bit more. Betsy, Peter, and Catarina left the house to go shopping. I stayed home, typing away at the kitchen table. My eye caught the three of them moving cautiously to the corner of the backyard. They were looking at something. I suspected they had found a wild animal. I looked towards where they pointed their eyes. I couldn’t see anything amiss. Everything looked the same. That’s when Catarina saw me looking and motioned me to come outside. Quickly. I slipped into my crocs and went outside, Wally faithfully following behind me. As I walked to the corner where the garden used to be (the deer had long ago won that battle). I still didn’t notice anything different. “Did you see this?” asked Peter. “What?” I countered. I had no idea what he was talking about. Like an optical illusion, the fallen tree now appeared before my eyes. The curtain had grown so large, I couldn’t tell the tree had fallen. The fact it fell behind the other trees helped hide it. The larger fact, though, might be that my father was right. I probably did plant those trees too close together. It also didn’t help that, for all its upward height, it, like other evergreens, had extremely shallow roots. 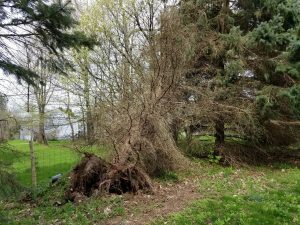 When the tree fell, I didn’t hear it.